The co-founder of Huckletree takes us from wake-up to wind-down. ANDREW LYNCH HAS had a run of good luck, but the 29-year-old Dubliner’s success with co-working provider Huckletree has by no means fallen into his lap. “If you ask me in 20 years time I’ll tell you I planned it all this way,” he laughs, his Irish accent still strong despite living the life of a true Londoner. Andrew banked on a career in property after he left school in 2006; he moved from Dublin to Waterford to study construction and economics. “By the end of the three years they were trying to convince us that we had a very transferable degree and we could go into whatever we wanted – as long as it wasn’t property! It wasn’t a great time, the end of 2009,” he reflects. Being born into a family of lawyers and entrepreneurs, Andrew was never going to throw in the towel. 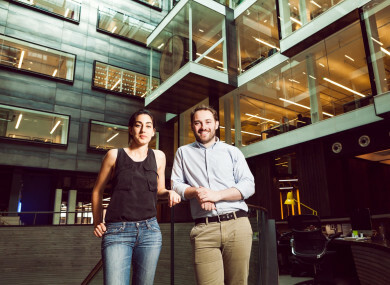 After further educating himself in the financial aspect of real estate investment, a conversation about co-working spaces with fellow entrepreneur Gabriela Hersham grew legs and Huckletree was born. “The harder I work, the luckier I get. I worked really hard and ended up in a place I really like,” says Andrew. We asked him what his life looks like now. 1. What’s your wake-up routine? For the last year and a half I’ve replaced my alarm clock with a little girl called Edie. She screams for a bottle any time between 4.30am and 6am, so I haven’t actually had to use an alarm clock! But I do try to get up at the same time every morning. When I wake up I check my calendar and I make a to-do list. The last while I’ve been making myself a smoothie every morning; it does resemble some kind of swamp juice in taste and colour though. You read all these things about ‘the seven habits of successful people’ and the one thing they have in common is that they all get up early. Another element is that they try to take as many small, minor decisions as possible out of their thought process throughout the day. Like, you hear about Mark Zuckerberg wearing the same t-shirt every day. I’m not quite there yet – but my smoothie is a good start! 2. What’s the first thing you do when you start work? When I’m in our Shoreditch space I take the Tube. When we’re in our West London space, which we’re about to launch, I take the bus because it’s quite close. When I’m in the City I meet Gabi (Huckletree’s co-founder and CEO), super early and we have a catch up for the day; another morning I could be meeting one of our investors; on Wednesdays we have our meeting with our Sales and Marketing team… I don’t think one day is the same. It ebbs and flows but one of the really exciting things is definitely when we’re launching a new space. 3. Who do you talk to most during the day? That’s an easy one – I speak to Gabi more times in the day than anyone else. ‘Work husband/wife’ is probably the best description, but I think the co-founder relationship needs to be based on really strong communication. We have each other’s backs in every single scenario, both inside work and out. 4. What’s your essential wind-down after work? Any time we’re not hosting events at one of our spaces, I try and get to the gym or do some form of exercise in the evening. The best thing I’ve been doing lately is yoga classes at Huckletree. Our focus on wellbeing and mindfulness is always something we push both our team and members to take advantage of. People always use the ‘I’m too busy’ excuse but I’m a big believer in finding time for things that matter. 5. What makes you feel like you’ve had a great day? This totally depends on my goals for the day. Today for example, I taught my daughter to say please and thanks – It will be extremely difficult for anything to top that today! Email “My Life In 5 Questions: Andrew Lynch on a typical day with his successful co-working startup”. Feedback on “My Life In 5 Questions: Andrew Lynch on a typical day with his successful co-working startup”.